Many people think they'll never have the opportunity, or the gear or the guts to explore the Amazon, but Delfin Amazon Cruises makes it easy -- luxurious even. No mosquito netting over the bed, no rustic jungle hut, no purifying the water before you take a sip. Sailing aboard Delfin III is more like staying at a chic, floating bed-and-breakfast than paddling upriver in a dugout canoe. If you've always wanted to see this storied jungle, this is the way to do it -- with great food, expert naturalist guides, interesting activities such as fishing for piranha and a comfortable private cabin in which you can rest and refuel. 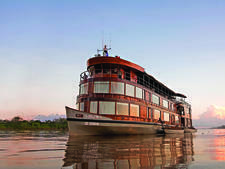 Delfin III, a 42-passenger ship designed to navigate the Amazon and its tributaries, sails the waters of the Amazon, the Maranon and Ucayali rivers on three- and four-night cruises. Here, the 8,042-square-mile Pacaya-Samiria National Reserve holds the headwaters of the Amazon, dense terra firma (dry ground) jungle and flooded jungle plains, nearly 500 bird species, jaguars, manatee, monkeys, giant river otters and gray and pink river dolphins. Your days start early, with 7 a.m. wake-up calls, followed by breakfast and your first excursion. Skiffs carry passengers and naturalist guides out on jungle hikes, bird-watching expeditions, even swimming in the river -- all the while scanning the water for dolphin and the trees for sloth. Along the shorelines, birds by the hundreds watch your boat pass by. You'll return for lunch and a siesta, avoiding the hottest, most humid part of the day, but you'll head back out in late afternoon to do it again. As your naturalist leads you along a jungle trail, you'll find yourself enveloped by trees and the calls of birds and insects while your guide shows you poison dart frogs, monkeys in the canopy above, termite nests and spider webs as big as hammocks. You'll walk through local villages and pick up handmade souvenirs -- animals woven from palm fibers and dyed with roots and berries, gourds carved with jungle scenes, even blowguns. After a day of adventure, you'll be back onboard, ready for a shower, maybe a dip in the plunge pool or even a massage. Then it's time for dinner, where you'll find the jungle on your plate as local ingredients and regional specialties make their way to your table. Fish -- the highly sought after doncella or the huge paiche -- and heart of palm, purple corn, camu camu and other exotic fruits make up each delicious dish. With a maximum of 42 passengers onboard, Delfin III never feels crowded. During the breaks between excursions, passengers hang out near the plunge pool or head indoors to the air-conditioned Canopy Lounge. Here, the bartenders shake up pisco sours with incredible speed and deliver them to whichever comfy couch or chair you've occupied. With windows all around and enough seating to give you privacy, even in a crowd, it's a lovely place to sit and take in the scenery, chat with friends old or new, or read. 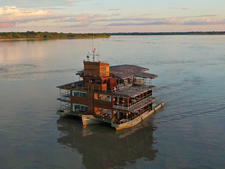 Is sailing the Amazon aboard Delfin III for you? Those seeking a more intellectual approach to the Amazon with daily lectures on the flora and fauna might be disappointed (though your naturalist guide provides plenty of mini lectures on your excursions). Likewise, if you need constant entertainment. Delfin III has none of the typical cruise diversions of big stage productions, dance clubs and gambling halls (although the crew forms a fine band and leads a raucous, fun-for-everyone dance party with Spanish and English hits). On a final note, the ship is elevator free and not accessible to passengers in wheelchairs or with mobility issues. A twin set of stairs is the only way to travel between decks, and loading and unloading the skiffs can be, at times, an exercise in dexterity. But if you're adventurous and are willing to step into a world foreign to your own, and can navigate boats, stairs and jungle trails to get the most out of the Amazon, you've found a great cruise on the Delfin III. The average age of cruisers on the Delfin III would fall in the 50-and-up category, with many retirees making the trip. On our sailing, we did have a large extended family (from Lima, Peru) that included teens from 15 to 18. Most passengers are well traveled, though few, even the Peruvians, had ventured to the Amazon. On our sailing, passengers were made up entirely of Peruvians and Americans, though Canadians and visitors from the U.K. do sail with Delfin as well. Onboard, announcements, menus and presentations were given in Spanish and English. Dress aboard Delfin III is casual. On excursions, it's best to wear something that dries quickly (you'll get sweaty) and has some built-in sun protection, so long pants and long sleeves are recommended. Technical fishing and hiking shirts and pants served our group well, as did casual and workout clothing. Bring sunglasses and a wide-brimmed hat, plenty of sunscreen and bug spray, as you'll need each of these. If you want, you can buy or treat your clothing with permethrin, an insect repellant available at larger sporting goods stores, though we found the mosquitoes left us alone after a dose of high-powered bug spray. You may bring your own raingear, but the ship does provide rain ponchos and rubber boots as necessary. In the evenings, most passengers kept it casual for dinner, with many women wearing summer dresses or loose, comfortable, cool clothing, and men wearing light linen pants or shorts with golf shirts. When sailing on Delfin III, your cruise fare includes all excursions and meals, most nonalcoholic drinks (Sprite was an upcharge, curiously), and transfers to and from the Iquitos airport at the beginning and end of your cruise. Wine, beer and cocktails carry an added cost that you can charge to your room and pay at the end of your trip. Tipping at the bar and spa are unnecessary at the time of service. On the last night of the cruise, you'll find comment cards and a tip envelope in your room. The recommended tip of $120 per passenger covers everything from the cabin stewards to the dining staff to the bartenders and guides. Onboard, the most common currency is the Peruvian sol (S/. ), though U.S. dollars ($) and credit cards are accepted.